MONTREAL, Feb. 12, 2019 (GLOBE NEWSWIRE) -- Osisko Metals Incorporated (the “Company” or “Osisko Metals”) (TSX-V: OM; FRANKFURT: 0B5) is pleased to announce results from 6 drill holes at the Titan Zone on its wholly owned Key Anacon project located 20 km south of the city of Bathurst, New Brunswick. Drill hole KAT-18-11 intersected 10.0 metres of massive sulphides grading 6.69% zinc, 2.46% lead, 0.54% copper and 58.79 g/t silver within a wider zone of mineralization (38.03 metres grading 5.06% zinc, 1.68% lead, 0.51% copper and 44.45 g/t silver), in an area 70 metres up plunge and southeast from drill hole KAT-18-08 that intersected 13.16% zinc plus lead over 8.0 metres (see news release of November 13, 2018 and the Titan Zone Longitudinal Section and Table 1). Additionally, drill hole KAT-18-23 intersected a copper-rich zone 25.00 metres below surface that graded 2.93% copper, 4.83% zinc, 1.70% lead and 34.16 g/t silver over 4.75 metres also within a wider mineralized zone. 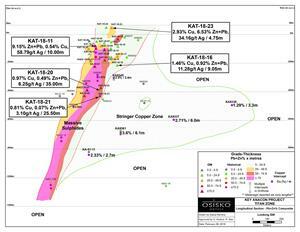 Finally, drill hole KAT-18-20 intersected a wide copper-rich zone of 0.97% copper, 0.42% zinc, 0.07% lead and 6.25 g/t silver over 35.00 metres. Jeff Hussey, President and CEO of Osisko Metals, commented: "The Titan Zone continues to deliver impressive grades and widths within 500 metres of surface. Not only does the Titan Zone contain zinc and lead massive sulphide mineralization, there is also significant copper credits locally. Additionally, there is a parallel Copper Rich Zone that is worthy of follow up. To date, the deepest intersection in the Titan Zone is 75 meters of massive sulphides at a vertical depth of 1,100 metres. We are eager to further unlock the potential of both deposits at depth and along strike. None of the past, nor current Titan Zone results have been used for estimating resources and we look forward to releasing a National Instrument 43-101 compliant Mineral Resource Estimate on both deposits within the Key Anacon project in the next weeks." Osisko Metals would like to thank the New Brunswick government for the financial grant awarded through the New Brunswick Junior Mining Assistance Program (NBJMAP). Through their continued support of the industry, Osisko Metals has used the grant for work at Key Anacon to develop this premier asset in the Bathurst Mining Camp.